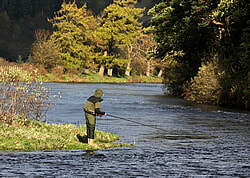 Professional guidance and instruction on the River Tweed system (Wild brown trout, sea trout, atlantic salmon and grayling) is available from Tweed Guide. This beat is one of the most popular upper Tweed beats. Much of the water is ideal for first time anglers, but there is plenty to keep the experienced anglers happy too. There are two miles of interesting double bank fishing and another mile of single bank, making three miles in all.